So I decided I'd create my own list of indications that your child is ready to use a potty. Your child pees and poops. Sometimes when you open your baby's diaper, he or she immediately starts peeing (especially fun with a baby boy!). Your child sometimes pees or poops in the bath. Your child can sit with or without assistance. Your child loves your attention. Your child enjoys being read to, finger plays, and listening to you sing songs. Your child resists being laid down for a diaper change. Your child really dislikes having a poopy diaper changed. Your child gets frequent diaper rashes. Sometimes you go to change your child's diaper and notice it's dry. Your child enjoys diaper-free/ naked time. Your child is enthralled with older siblings. The truth is, your child can start to use a potty at birth if you are so inclined. So the signs above are not signs you need to wait for, just indications that now might be a great time to try putting your child on the potty. When you are willing to consider the possibility of early potty training, certain otherwise annoying occurrences (an infant boy that pees everywhere in the middle of a diaper change, a baby that poops all the time in the bath, a toddler that is so attached to you that you either have to take her to the bathroom with you or listen to her scream the entire time you are in the bathroom) can be re-framed as opportunities for early potty experiences. 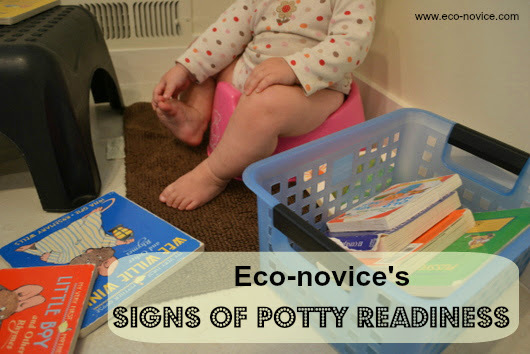 I personally like to start potty training (or elimination communication, whatever you like to call it) when my child can sit reasonably comfortably on a little potty with assistance (around 4 to 6 months). That's what works for me. When do you like to begin potty training? LOVE this. The AAP recommendations make me so mad. Those standards were invented by the diaper industry! We like to start around the time baby can sit up too, although we did get a giggle holding our newborn to poop into the bathroom sink!